The International Link of Ortodox Christian Scouts "DESMOS"
Already conferring in Tunis, close to the ancient and infamous city of Carthage may you be inspired by the heritage of the brave martyrs and the personalities of our churches in north Africa when the lands of paradise were enriched. Our orthodox faith as you know is not application of typical and strict regulation, but in the country of apocalypse of the supralogical love, of self-love of our lord Jesus Christ, who being God, became human in order to cultivate humans approach God , as Athanasios the great wrote. Our Lord has revealed to us the fullness of the tripartite God, which stands in eternal conference in love for humans catering to the creation. Likewise you all present in conference are imitating the fullness of eternal conference in order to exchange experiences and views and reunite though the bond of the holy spirits enriching the scouting dimension. From the Seat of the Ecumenical Patriarchate, we give you warmest Patriarchal Blessing, wishing full success to your work and progress in God in aspects of your work, inspired by the spirit of the Holy Church of Christ. It was during the 33d World Baden-Powell fellowship meeting in Aghios Nicolaos - Crete, September 1993, where as International Commissioner of Soma Hellinon Proskopon (Scouts of Greece), I had the first discussion with Dr. Jacques Moreillon, Secretary General of WOSM, on the idea of the formation of an International Link of Orthodox Christian Scouts, in line with the long existing International Catholic Conference on Scouting (ICCS), and the International Union of Muslim Scouts (IUMS) . The then President Mr. Alex Comninos and Chief Commissioner Mr. Christos Lygeros, both agreed, the Scouts of Greece to offer their assistance to this cause. After getting the mandate from the World Scout Bureau, I started working on the Statutes in consultation with Alex Comninos, Dimitri “Rann” Alexatos, Malek Gabr Deputy Secretary General of WOSM, Dimitri "Smokey" Georgides and with the close assistance of other specialists. Then during the International Symposium in Marrakech, November 1994, representatives of National Scout Organizations members of WOSM together with not yet recognized Scout Associations, whose membership included Scouts of the Orthodox Christian Faith, met and agreed on the creation of “DESMOS”, the International Link of Orthodox Christian Scouts. It was agreed that the main objective of DESMOS will be in parallel to the promotion of the principals of brotherhood and understanding among Scouts, to promote also the spiritual dimension of the Orthodox Christian Faith among its Orthodox Christian members and to establish and promote co-operation on this matter, with the Orthodox Christian Churches. At the same time the first draft of the Statutes was presented to all those who attended the meeting. In October 1995, a circular letter was sent to all those who were present at the Marrakech meeting, together with the proposed Statutes of DESMOS as cleared by the World Scout Bureau, with the request for their views and proposals in order to finalize the procedures and announce the final dates of the Inaugural meeting. The Inaugural meeting took place in Oslo, Norway on July 7th 1996, before the opening of the 34th World Scout Conference and it was attended by representatives of the following National Scout Organizations members of WOSM : Cyprus, Egypt, Finland, Greece, Romania, USA, and Yugoslavia. There, after presenting the particular formalities and legalities involved, we finalized the procedures establishing this new body which would bring the Orthodox Church closer to the World Scouting affairs and agreed in accepting in principle the Statutes, appoint an Interim Executive Committee, authorize the Committee to organize within the next 12 months the first Conference and finally accepted the invitation of Soma Hellinon Proskopon to host the 1st (Constituent) Conference. The five appointed members of the of the Interim Executive Committee was: Christos Papageorgiou from Greece, Tony Papantoniou from Cyprus, George Bouloukos from USA, Nikola Petrovic from Yugoslavia, and Adina Dabou from Romania. The World Scout Committee in its meeting of July 10th 1996 in Oslo, appointed me as Link with DESMOS and authorized me to represent the Committee at all DESMOS meetings, and activities.. The Interim Committee met in Athens on November 23, 1996 in its first meeting and after electing as Chairman Mr. Christos Papageorgiou, discussed all the necessary steps towards the Constituent Conference. 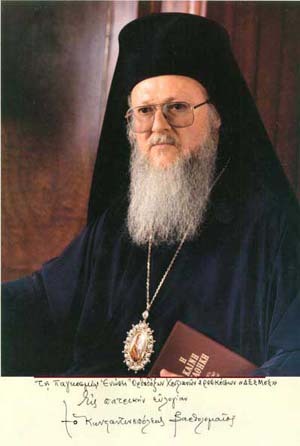 At the same time His All Holiness the Ecumenical Patriarch Bartholomew I, through His secretary Bishop Meliton, sent to George Hourdakis, International Commissioner Scouts of Greece, His blessing together with His remarks on the Statutes, which was immediately adopted by the Interim Executive Committee. Now, almost 4 years after we slowly started establishing DESMOS, I feel happy being here, in the Penteli Monastery, among all my brother Orthodox Scouts representing National Scout Organizations from all over of the World, having my mission accomplished, and proud of the work done and the results achieved. It is up to all of us now, to carry on and strengthen DESMOS in its first footsteps, for the benefit of Youth, the benefit of World Scouting and the benefit of Orthodoxy.